Here in Europe, coeliac disease is the most common genetic illness, with one in every 250 Italians and one in every 300 Ireland being affected. There are thousands of reasons for people with coelic disease – or intolerance to gluten – to travel: holidays, business trips, study, family get-togethers, and so on. So how can people with gluten intolerance cope? There are distinctions between international air carriers and domestic ones – most international airlines will offer special meals if you give them advance warning, and most will also have menu options listed on their website or with travel agents so that you can order a gluten-free meal, although these are not always available if you also have religious or cultural dietary requirements too. Domestic airlines may be much less accommodating and you may need to take your own food, in which case be aware of restrictions on what you can carry and the type of container you can use. It’s not much fun to have your carefully prepared meal confiscated because it doesn’t meet security guidelines! If you’re buying packaged food, check the product label very carefully as not only may there be difficulties in translation, but food labelling may be different to that used in your home country and key allergic ingredients may not be featured. In the EU ‘major’ ingredients must be listed while trace ingredients may simply be mentioned on a different part of the label, and in many countries there may be no labelling at all. It is also important to remember that different cultures use potentially allergic foods in preparing sauces and seasonings or for thickening foods. Weisse beer is a German beer that is made from wheat, rather than just being a ‘white’ or pale beer. Japanese and Chinese cuisines use soy in soups and sauces, and some fermentation processes involving soy will also include barley or wheat – this is especially true of Miso, a broth that is made from soybeans and barley but may also wheat or rice. 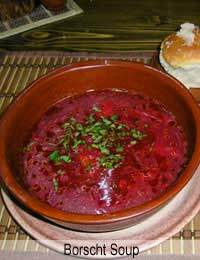 Borscht, or beetroot soup, is a staple food in Eastern Europe and can be thickened with barley. If you’re travelling abroad, you may want to gain an understanding of the local culture or enjoy local cuisine, and while ordering food may be easy, it can be very difficult to find out whether any given food contains a potential allergen such as gluten. It may be important to do your homework – find out the local terminology for gluten, wheat and any other allergen you may be prone to. Remember that not everybody you communicate with may be able to read: while hotel staff should easily be able to respond to your written list of potential allergens but people selling food in markets or on the street, taxi drivers and so on, may not cope so well, so having a photograph of wheat and one of flour, for example, can be very useful. Also be aware that cross-contamination is likely in food preparation facilities, for example by one food being cooked in a pot or pan that has previously contained wheat, or with a food handler transferring gluten from one dish to another on their hands. It may be better to eat in starred restaurants and hotels where possible, make sure you also carry a plastic spoon and fork and some anti-histamine so that if you do end up with a mild reaction through trace contamination, you can self-medicate until you can get medical support.